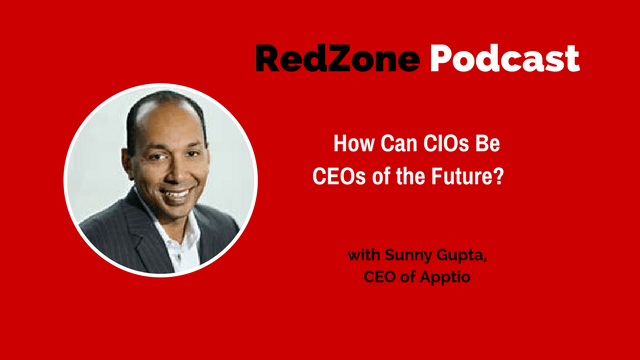 This week my guest is Sunny Gupta, CEO of Apptio. I looked into Apptio software used by a previous podcast guest Bob Fecteau, CIO of SAIC. I had to check it out because I got to see what Bob was dealing with and why Apptio added such a tremendous value for his business. During our interview, Sunny shares the story of Apptio’s genesis and I think every CIO can learn from it. It is fascinating how Sunny was able to take a problem of one CIO and reconstitute it into a solution set that ultimately addresses all today’s CIOs and their challenges. I thought, many of you are constantly solving problems for other departments within your business, but what about yourselves? How are you, the CIO, solving your own enterprise resource planning? You will find this interview useful if you want to learn how to build transparency, trust and confidence and have a seat at the table. Sunny and I also talk about defense and offense, comprehensive IT, vendor, cloud spending. I believe that this type of approach to bringing IT together would only work today. Many of you, CIOs, are at that point where you are looking to up level your skills as leaders, as Sunny put it, CIOs are technologists wanting to be business people without going to business school. Listen to this interview to get practical advice on how to gain visibility into your IT cost management and find out how Apptio is collaborating with IT leaders today to achieve that. System of Record for IT that came out of the need to manage business, analytics and decision-making for CIOs. Listening to the customers and morphing, changing execution plan based on hearing from CIOs, gave Apptio its start and growth. Apptio as an “ERP for CIO” helps IT Leaders become more business-oriented. Apptio’s standardization function is explained. Apptio as a framework of language and transparency. Technology Business Management Council is a non-profit organization created by Apptio and dedicated to industry standards and an operating model for CIOs. What role does Apptio play with the speed of change? How Apptio helps CIOs innovate and dive into transformation projects? How is Apptio helping CIOs win with their business? Practical advice for CIOs on how to get started. Apptio solution helps to get granular transparency into CIO services and products spending and uses it to create an offense dialogue with the business. Automating your existing budget, planning, financial management discipline. Categorizing the vendor’s spending fine optimizations. Getting control of your Cloud spending. Bill:	Sunny, well I want to welcome you to the show today. Sunny:	Thank you so much for having me today. Bill:	So before we get started, I think it'll be great just for us take a step back and if you could just introduce yourself to my audience. They've gotten a bit of an overview already about your series of successes. But what's not really captured in the Linkedin profile prospective is like where did it start? Where did you grow up in and how did you get to where you are today? Yeah, hi. So I'm currently the CEO of Apptio, which we'll talk about a little bit later. But really my journey started, I grew up in a town called Chandigarh, north of New Delhi, India. And came to the US for my undergraduate education, back in 1989. And the impressing story is my father gave me basically $2,000. [inaudible 00:00:58](phone went out of range) just (phone went out of range)my education so [inaudible 00:01:05] and came to the US went to the university [inaudible 00:01:15] graduate computer science and math. And given so I had left my family and I was on pretty tight budget, I worked tirelessly through the school and also wanted to graduate at a faster pace. So I completed my undergrad degree in three years. Bill:	So you've had a series of successes with different businesses since you graduated. But you've been..you settled into APPTIO for almost a decade now, right? [00:07:30]	Yeah. APPTIO was started back in 2007 so, in the fall of 2007 although we started thinking of the idea in the summer of 2007 so yeah, this is a...it's exciting but this is the longest place I've ever worked in my professional career and I'm loving it and it feels like really the super early days of APPTIO put me still. [00:08:00]	Well it seems like that. I thought "gosh, ten years". And in fact, well that's really cool and I'd love to know where...what was the originating thought around APTO? Was it a coffee shop conversation? Was it just a sequence from one business to the next? You just knew this was going to be the next one, or how..what was the genesis of APPTIO from a thought perspective? [00:09:00]	Yeah, so really the genesis of APPTIO story started back in 2007. I had sold my previous company. Iconclude Opsware. Which was a publicly traded company run by Marc Andreesen and Ben Horowitz. Who are leading venture capitalists now. And I was part of the opsware management team and we had sold that business to HP for 1.6 billion dollars. And really this was the summer of 2007, where I felt like my previous company had gotten sold too early. And I really didn't know what to do next in my professional career but there was this really unsatisfying feeling inside me. and I was in my thirties, and i was contemplating whether I should go into the venture capital or whether I should do something more into the entrepreneurial space. And I was traveling to New York. Specifically talking to some of our large customers who had bought, you know, who were customers of Opsware. [00:09:30]	I remember sitting with the CIO of Goldman Sachs. And he asked me what I'm going to do next and I started asking him what's some of the challenges they were facing in IT. And he just started describing that really IT is more fundamentally complex than ever. More strategic than ever. Powering every major business process in the enterprise. And he said, I specifically remember that while the CIO has many technical systems, like automation monitoring service management. But there's really nothing to manage the business and analytics and decision making for the CIO. [00:10:30]	And that five minute conversation turned into an hour. And on a long plane ride home, I started thinking "wow, why hasn't this problem been solved before? Why hasn't somebody innovated in this area?" And then that was really the early genesis of APTO. I talked to probably 40, 50 customers, CIO's large and small and I remember waking up in the fall of 2007 and telling my wife that "hey, I'm ready to build a next sales four star com for the CIO". And that's when I knew that I wanted to start APPTIO. [00:11:00]	Well I think that what's really interesting is you..I love, and this is part of what I try to teach in our groups here. I think the CIO is this really interesting listening to your story. You've the ability to take a problem and reconstitute it into a solution set from just listening to one CIO and that morphed into 40 more conversations. And then all of sudden it was the genesis of something substantial and something of value to the CIO. That's powerful. And I think every CIO can learn from that story. [00:12:00]	Yeah, you know it's..I mean I often, I think even today we feel like we are just learning the deals of learning and morphing and frankly I would also say even from the first day, the metal level idea has not changed but the business plan frankly from even the early part of 2007 to what APPTIO is today is fundamentally different and that would not be possible if we weren't listening. Listening is one thing but the second most important piece is morphing. When you're taking..when you're listening continuously but also morphing the idea, to cannot really evolve into what our company is today and that's certainly emphasizing so much for the CIO's. I know technology is changing at such a fast pace that that's a fundamental thing they must do, whether it's externally what's happening but also what maybe the different needs, if you will. Which are emerging within the enterprise. So listening and morphing is critical to the success of every CIO. Bill:	When you say morphing, can you explain maybe with some more detail what do you mean by morphing or an example? Yeah, I'll give you a specific example in our business with morphing. Really what I mean is when you listen your feedback which you may be hearing from your counterparts or your customers may be different than what you may have in mind. So ability to change your ideas. Ability to change your execution plan based on hearing from people. In our case, when we started APPTIO, we were first thinking about not necessarily targeting the CIO because we thought it would be very hard to get the CIO for a very small company, you know, which didn't really have a broad footprint. And a lot of CIO's said that "hey, it would be very hard for CIO's to return your phone calls and so forth, like we're all busy. Especially the fortune 500, fortune 100 CIO'S". So our original idea was really to target directors within IT's. [00:14:00]	So director of Gestalt, director of Compute, director of Storage. So really two to three levels below the CIO. We thought it would be easier for us to gain traction and we'd sell them smaller footprint products. But as we started engaging with the CIO's, they said "look, this is kind of really tied to the transformation, which is happening in the CIO and you better, you know, even though you're a small, no name company, you will get a lot of traction because we are all technologists wanting to be business people without going to business school. So APPTIO could be one of the platforms. So you should try targeting us directly and providing a value proposition to us and this is a decision which only the CIO along with the CFO can make and the lower level people in the organization may not be able to make such a decision". So frankly, we've listened and we tried a few things and that strategy started to work so that's a really good example of morphing and listening to your customers. So do you.. would you say it's accurate or was it too simplified for me to say APPTIO is similar to an ERP for the CIO or an accounting financial system for the CIO or how do you describe yourselves or is that too simplistic the way I said it? [00:15:00]	No I think that's very simple. I think that's a really good analogy. Really the way we talk about this is that look every function in the enterprise has a business management system so if you think about the CFO has the ERP or financial management systems. The head of sales has CRM systems. Head of marketing has marketing automation like Maketo or Eloqua style systems. And the CIO may have many technical systems but they really don't have a business management system. So really what CRM does for the head of sales, APPTIO does for the CIO to help them manage the business of technology. Yeah and one of the things that is I was introduced to you was, it seems like you kind of carved out a segment. And what I mean by that is, you know, the CIO's are relatively new position as compared to the CFO or the CEO or president or operations, I mean we could trace back to probably the founding, at least the, to the industrial revolution or even maybe back I think they have the numbers in accounting back in the Greeks or not Greeks, but the Egyptians. But certainly, in the 80's and 90's, we really saw this growing of the CIO's. We really don't have a long track record. Are you finding that's an opportunity to settle in and kind of create the space or sort of hindrance because people are confused some? [00:17:00]	Yeah you know I would say that's very accurate that the CIO function is a very new function in the grand scheme of things, when you compare to a lot of the other peers in the enterprise. And that's actually been a good enabler for us and frankly the CIO function has been primarily focused on managing the technology itself. They've been managing and putting in place technology for the business and primarily they've been back office. And we are seeing massive changes in that CIO function. Right now they are going from being the back office to front office. And given the strategic importance of technology, they have to become more business stewards, they cannot be just technologists. [00:18:00]	And really that is creating a massive opportunity. Now the CIO is very used to buying the ERP systems. They're very used to buying CRM systems. They're very used to buying back office systems like mail office 365 or those type of systems. But they're not really used to buying business software and business analytics for themselves. You know, for their own functions. So that's what's the opportunity. So really we find ourselves in a fascinating mix where the CIO function may be new. They're used to doing things a certain way, like ERP and so forth, but we're also providing them a catalyst for the new transformation which is happening. So it's really the world they lived but also the world they need to live in. Bill:	So what you're saying is they're so used to solving other peoples problems that now, it's almost like the cobblers, with the cobblers story where the cobbler has no...the kid's have no shoes sort of thing. You almost have to... you're turning it back on themselves in some respect to kind of solve their own issues. Yeah, absolutely. In fact, we use that statement all the time. Cobbler's children having no shoes. And really I think, you know, if APPTIO could not have existed in my opinion, in the late 90's, right? I mean that would be [inaudible 00:18:43]of ERP and that would be [inaudible 00:18:47] of CRM systems with seeble sales force marketing automation systems. So IT's strategic importance needed to go way beyond from the back office to front office. Spending technology needed to rise. Certainly the cloud created a level of complexity in the IT operating model for the CIO. 70% of every CIO's budget was tied and run on maintenance activities. And finally, the CIO function got to a place where just being that function for technology, management of the technology was no longer sufficient. [00:20:00]	They needed to demonstrate the business value of technology investments. They needed to be better stewards of [inaudible 00:19:35] capital, right? Which is fundamentally there or violations capital and technology was fundamentally a black box. And so that became the catalyst. So really, when we started the business in 2007, I personally believe that it could have been done. Our category could have been done earlier and now we are seeing a tipping point, right? Given sort of what is even happening in the last ten years. [00:21:00]	I agree with you. I think there's a timing to this all. And also, I agree with you that the...it's funny, there's been so much time to mature the other ends of the business because they've had time. And they've had time for even a lot of market ups and market collapses of kind of built sort of the accounting fundamentals and the auditing foundation practices for CPA's. There's no, I mean, the CFO, in my opinion, has a massive advantage because they have, they can hire people all, to follow gap accounting principles. Debits, credits, income statements, balance sheets. But we're having that language, that language that really all people, even if you're an english major in college, you have to take some business that you understand those fundamentals. Largely on the IT side there...we've missed that language. So it seems in some respect you've also inserted a framework of language and of transparency. Would you say? [00:22:00]	Yes, absolutely. You know, I'm glad you kind of brought this up. When I first started to talk to a lot of executives, both in CIO functions but also the CFO function, what you're saying is really what CIO's and CFO's were telling us that "hey, the finance leaders have a gap accounting standard and it's a fairly standard ways to read a balance sheet or an income statement but [inaudible 00:21:32] existed for IT leaders. So, I remember back in 2010 when there were five or six of our large CIO's. I remember the CIO of Cisco, for example, Rebecca Jacoby at that time. She used to work for John Chambers at Cisco. And few others from very large scale organizations coming to me and saying that "hey, what the problem which APPTIA is trying to solve is pretty universal. But one of the things we want you to consider is, create an organization which is just purely, you know, dedicated to creating standards. Pretty similarly to what the CFO has. So would you consider creating a non-profit organization". [00:23:00]	And we took their feedback and we created a non-profit organization called TECHNOLOGY BUSINESS MANAGEMENT COUNCIL, or the TBM council. And it's really dedicated to creating an industry standard taxonomy and an operating model for the CIO. Like what are all the services and products a CIO delivers? Infrastructure services and user computing type mobility telecom, you know, applications. As well as business capability, like order to cash. And that taxonomy did not exist before. A standard cost model did not exist before. Many of our customers had on premise and cloud services. How do you account for those things? How do you account for fixed versus valuable expending? [00:23:30]	How do you account for change, run transform capability? How do you account for a standardized way for a CIO to have a conversation with the business leader within their enterprise? So we've created a lot of these standards underneath the PBM council, which is now up to 54,000 members led by 20 leading CIO's. And it's really become the catalyst. It's become the standard way of how CIO's are communicating the business value, measuring themselves, benchmarking themselves, and really managing this really complex hybrid IT landscape. [00:24:00]	So the standards we believe are key. But we also believe that, you know, we are frankly, are a very, very early stages of this. And if you pass over ten years from now, we believe this will be similar to what the gap standard is for the CFO function. [00:25:00]	I agree with you. It's one of these pieces we won't have as a...we're going to mature but it's going to be...these standards are going to mature at pace we're not going have endless years to figure them out. They're almost going to have to be...they're going to have to have mobility and change built into them. I'm curious though what you think about...how do you feel the speed and pace of change, what role does APPTIO play with speed. Like, for example, is there a way that you can take things out that never changed so that there's a standard of things that we know of how to communicate that are never going to change so though we could move fast around things that are innovative or how do you see people able to go more confidently achieve innovation and dive into more transformation with your product. [00:25:30]	Yeah, so you know, I would say you're absolutely right Bill. There are certain parts of the operating model for the CIO which are not really changing, right? So CIO will always have to provide infrastructure services, whether they are procured from external sources like AMAZON, AZURE or whether they are built internally in their own on premise data centers. They always have to provide application capabilities. They always have to still provide, you know, things like telecom mobility computing, right? All those things are not changing. They have to manage their spend. They have to manage at a granular level. They have to do planning. They have to continuously do cost optimization. [00:26:30]	They have to continuously free up capital from running to come more innovation, right? Those things are going to remain very, very constant. What is really changing is, the two things in my opinion, one is the digital enterprise technology is more strategic than ever. And the CIO is being asked to deliver leverage technology, to deliver fundamentally more business innovation. New revenue screens, automation of labor within manual processes. And technology is fundamentally become more strategic. Every company is a technology company. So that's one thing which is changing at a much faster pace because technology is a boardroom dialogue now. [00:27:30]	And the second thing which is changing is the underneath technologies and the vendor landscape at a pretty massive pace, right? So the pace of innovation in cloud services, where you can go buy compute storage, higher level services like lambdanet and so forth. Databases, you know, that pace of technology innovation is at a much, much faster pace and that's creating a fundamental shift in the operating model and at the pace of which the CIO has to react. They have to continue to do maintenance and running the services but they also have to be able to act at the pace of the business. [00:28:00]	And also in leverage these new technologies. And that fundamentally creates additional challenges. So some things remain the same. And really the role which APPTIO places, helping any CIO get deep transparency into the technology spending. So really without cloud waste applications, technology leaders can really manage, plan and optimize their technology investments across both on premise and cloud services and then they can incorporate these new...they can measure the investments in these new digital platforms by funding them by even squeezing out funding from existing run paradigms and also going to manage this very every changing complex vendor landscape. And, so that's going be opportunity we see ahead of us. It's interesting in the innovation group that I host for CIO's in the middle [inaudible 00:28:33]area. We talk about offense and defense, actually break the group into offense innovation and defense. And I often think that defense is the new, can be the right, the new offense. And what's interesting is you talk transparency from me and genders and brings up defense. But I think when you talk about transparency and I'd like for you to talk about it further, I actually think it opens up offense opportunities for the CIO that they otherwise wouldn't know. But maybe you could talk about what's the current state that you see for transparency with the CIO and kind of where you see that moving over the next couple of years. And what opportunities you see for the CIO are able to kind of achieve these new levels of transparency in their organization. [00:30:00]	Yeah, so Bill you're so right around the defense versus offense. Basically you can think of transparency as defense but really if you think about the forward leaning CIO's who have really adopted our platform and solutions. What they're really doing is, you know, look the reality is you can't really optimize something which you don't have transparency into. So majority of the CIO's we engage with have some level of transparency. They have to, right? Otherwise it's very hard for you to operate these environments. But they don't really have the granularity of the transparency and they don't have really data delivering decision making capabilities at their fingertips. It's very hard to do that on Excel. So they are leveraging the APPTIO solution to get deep transparency, more granular transparency, more automated transparency into their services and products. [00:31:00]	In the word part of the spend is change versus run, fix versus valuable, what part is on the cloud services versus premise so they're able to make data demon decisions. And some of the forward leaning CIO's are using that transparency to create a different type of dialogue with the business. Because part of the issue of technology investments is that the business does not really understand the true cost, fully loaded cost of running and operating technology services. So a lot of these CIO's are using this transparency to create an offense dialogue. They're saying "look, the cost of a server, the cost of a desktop, the cost of running and operating an application, trading an application is not really what you can just go buy from Amazon or Apple or Dell. The fully loaded cost of a server is three x or five x or two x more than just the cost structure, right? Of what it takes to procure one of these things". [00:32:00]	And as a result, the business, the CFO, the CEO, the boardrooms get a lot of empathy. And the CIO [inaudible 00:31:34]turn. That emotion based discussion into a fact based discussion and that starts to make them become more on the offensive side. Where the cost between the business and IT leadership is so much now that the business says "you have been incredible stewards of our capital by providing this level of transparency. So we want to provide you even additional more funding for new net, new initiatives for new product development in the agile development sense. In new project funding, so you can become more a chief digital officer rather than a chief information officer and create net new innovation, if you will, for the business." [00:33:00]	So we believe transparency is foundational and a stable stakes that leads to better planning. The man management with the business, it leads to a credibility of the CIO. It leads to the budgets eventually going up. And then managing a bigger real estate to drive more digital innovation within the enterprise. So the offense and the defense we believe is paramount and I really believe that the CIO's that don't embrace the transparency in the new digital world we live in are going to be really left behind. And this is a must have discipline because even we as human being and individuals, right? Have transparency into our personal budgets, into our personal pockets. At home we all use some levels of software, so, you know, it's very hard to have transparency in a ten hundred, ten million, hundred billion dollar IT budget when you're trying to do that on spreadsheets. Yeah, I couldn't agree with you more. I spend most of my time on the security side of the fence with transparency and I just been in so many boardroom conversations where I've seen the CEO just raise their...and the board, showing the board and the CIO and the C, sorry, CEO and their showing the board just raise their hand and almost like a huge sigh of relief comes down when you can demonstrate stewardship over the facts across the entire portfolio. All of a sudden, there's this massive shift and confidence and less on the feelings but more because you can demonstrate the facts at scale. I think that's the biggest is that scale and gosh I couldn't agree with you more in what you just said. [00:35:00]	Yeah, you know imagine a CIO walking into the boardroom or walking into a executive leadership meeting and each one of his peers has a business system analytics strike which their reporting, which by the way, as a reminder, the CIO is the one which put those systems in place for those other functions and now for the first time, the CIO, even though they may not be a 100% accurate, in all the information, but even if it's 85, 90%, it's good enough. And now they're, they have a true data driven approach. Which drastically changes the dialogue and they're now viewed more as a business leader from their peers rather than a just a technology leader. [00:36:00]	Yeah, incredibly it's, I think this and you've defined a niche which, I'm not sure you knew that starting out but you've definitely carved it out now and I think that it's funny, I do believe the CIO's have seen them. The ones that can embrace this, they have a much more powerful dialogue, much more powerful affect at the senior level, it's like, it's not even close. I've seen CIO'S walk in for budget on...but you can't...but they run in with the spreadsheet and it's funny. They have no language in which to communicate the complexity of what they're facing and how they're convinced that they're spreadsheet has got it. But do you have a process that the CIO, like if someone was really curious about how APPTIO could fit for them. Is there...could I link them to a part of your site that you think would help them understand sort of the power of what you bring to bear. [00:37:00]	Yeah, so I would say you know the best resources www.Apptio.com. And there's a lot of information on the website which including are testimonials from some of the leading customers. Today there are greater than 50% of the fortune 100 companies which use APPTIO. But we also have hundreds of companies that have very, very small IT budgets. You know even as little as 10,000 million IT expense are using the APPTIO platform. That would be the best resource and from there they can even, if they want to engage with us, they can download collateral, but they can also request a more important demo or just an online demo, which gives them access. But there are many ways for CIO's to get started. [00:38:00]	One is really, I'd say, basic transparency into the technology spending. You know, with very little investment in less than three months, you know we can get a customers cross model set up with a lot of analytics. The second place our CIO's are starting is just by automating their existing budgeting, planning and financial management discipline. And third way is a lot of our CIO's want transparency into the vendor spending loan and they just want to categorize the vendor's spending fine optimizations and the fourth way is a lot of CIO's are saying "boy, I'm moving so fast in the cloud, let me try to get control of my cloud sprawl, cloud spending. So that's a fourth area of how CIO's can get started. So easy ways for them to get started. We can also connect them and network them to their peers. It's a pretty, one of the largest community of CIO's and CFO's who've adopted the solution and we can connect them to them and they can..that can be done through TBMcouncil.org site and that's a non-profit site and a lot of CIO's are up there and that's another kind of great resource. So I'll link to that on my, I'll link on the show notes page, I'll link to that the TBMcouncil. I'll link to the cloud sprawl section and the vendor spending, the business planning. And I missed the first one but I think that's APPTIO.com. Sunny:	Yeah, that's just APPTIO.com and the cost transparency site. Speaker 3:	[inaudible 00:38:47]I can definitely send you some links to those resources and other materials that you can use as well on your posting. Fantastic Ellie. Well, Sunny, I want to thank you for your time. For creating a very powerful way to help CIO's, which I believe is the next evolution of leadership that CIO's are going to need to demonstrate and I think for the amount of complexity they're handling, anything that they can do to simplify such that they can use their influence and their skills to really help businesses move forward I think is a very, very powerful place to be in so I want to thank you for your contribution to the community. Thank you Bill so much and your absolutely right, it's being, the CIO function being the most strategic as the world moves to digital and number two being the most complex. We fundamentally believe on one hand that the strategic nature on the other hand the complexity and we believe this will be one of the most strategic functions in the enterprise. We believe CIO's have the opportunity to be the CEO's of the businesses because this is a function which will balance these two vectors and it's changing at a fast pace so thank you for giving me the opportunity today. Bill:	My pleasure, my pleasure. Well, thank you and I look forward to connecting with you in the future. Have a great day. Sunny:	Thank you so much. Have a great day. CIOs are the Merlins and Magicians of the Future, but it Starts Now! This entry was posted in Blog, podcast and tagged Apptio, Bill Murphy, business management, CIO, CISO, ERP for CIO, information, innovation, IT, IT Security, leadership, management, Redzone Podcast, software, solutions, Sunny Gupta, Tech Experts, technology, visualization on April 20, 2018 by Bill Murphy.